Here I will attempt to calculate the heat transfer from the combustion gases to the coolant of the cylindrical combustion chamber of the proposed rocket engine. This will allow further calculation of the minimum coolant flow rate required to safely remove this heat. I am not going to give exhaustive details of the calculation method, as this was comprehensively covered in my previous post dealing with the heat transfer in the nozzle section. In order to proceed with the heat transfer investigation, it is necessary to calculate the chamber heat transfer coefficient, or hg. RPA gives all of the relevant variables to do this apart from one, this being the velocity of the combustion gases in the chamber. This velocity is generally defined as “low” in the literature. How low is low though, bearing in mind we are comparing it to sonic and supersonic velocities in the nozzle and divergence? RPA gives the total mass flow rate through the engine as 4.4 kg/sec. Given that the chamber area is 0.0167 metres square and the density of the gases at this point is 2.5 kg per cubic metre, this gives a velocity of about 103.5 m/sec. Now we can work out what the heat transfer rate, or q is. Recall that to do this we specify a temperature that we want the hot gas wall to be at, given the materials thermal and mechanical properties. We will go with 420K as before. We now subtract this from the adiabatic wall temperature and then multiply by hg. The adiabatic wall temperature in the chamber is derived by multiplying the stagnation temperature by a so called recovery factor, or r. Experiment shows that for practical purposes r = 0.9. RPA gives the stagnation temperature in the chamber as 2170K so the adiabatic wall is at 1953K. The specific heat of the fuel at this temperature is 3360 J/kgK. Let us again allow a temperature rise of 30 degrees for the coolant in the chamber. This gives a coolant i.e. fuel temperature of 120 deg C on entering the injector. We already know that the boiling point of our fuel, which is at elevated pressure, is above this. To calculate the minimum amount of coolant flow, or mdot, required under the above conditions we divide Q by the product of the specific heat of the coolant and the temperature increase desired. As was previously mentioned, the fuel/coolant flow rate will be in excess of this figure and so it seems highly likely that the chamber will be able to survive the heat load imposed upon it by the combustion gases, given the design fuel flow rate. This post is going to deal with some tentative calculations on the quantity of heat transferred through the walls of a rocket nozzle I am building. This study is part of my ongoing engine project. To be more specific, I’m interested in finding out how much coolant flow will be required to safely absorb the heat generated by the combustion gases. It is said that when the engineer who designed the cooling circuit for the Saturn V rocket motor was given his brief, he was told to “make sure it doesn’t melt”. The aims of rocket engine cooling design cannot be put more succinctly than that. The material I’m using for the nozzle and combustion chamber of my engine is 6082-T6 aluminium. I chose this for a number of reasons, primarily that it has high thermal conductivity, low density combined with high strength and is easily machined. Strength is one of the properties that I want to conserve since the pressures inside the engine are relatively high. This isn’t easy when you consider that the gases flowing through the chamber and nozzle are somewhere in the region of 2000K (1700 degrees Celsius). Just how exacting a task this is becomes even more apparent when it is realised that the tensile strength of 6082 drops to 90% of the room temperature value at just 420K (about 150 degrees Celsius). A rocket engine cooling system is really a type of heat exchanger, where the heat from the high temperature gases inside the chamber and nozzle are transferred to the coolant via forced convection and conduction through the chamber and nozzle walls. The snag is that the coolant is often also the fuel. This means that unlike a normal heat exchanger design in which the coolant flow rate can be made whatever is required to do the job, in a rocket engine we have a flow rate that is already fixed by the mixture ratio of the engine. I mentioned in my earlier post that I’m using nitrous oxide and isopropanol as propellants in my design. The isopropanol will be the coolant, mixed with about 20% water to improve specific heat capacity. I’m using an oxidiser to fuel ratio of 2.125. This is very fuel rich but it means that the chamber and nozzle temperatures are much more manageable. To help me in my rocket engine design activities I use a piece of software called Rocket Propulsion Analysis, or RPA. It is produced by Alexander Ponomarenko. 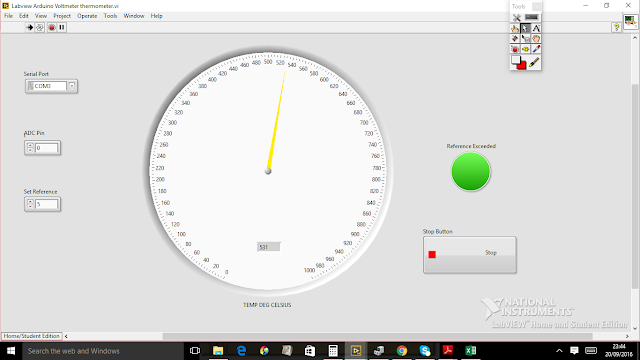 This software calculates engine performance parameters based on user inputs from a projected design idea. So the first thing it would be useful to know in designing the engine cooling system is how much fuel, i.e. coolant flow is there to play with? For an engine design of 8kN (about 1800 lbf) the isopropanol flow rate is 1.4 kg/s. The fuel i.e. coolant flow rate is denoted by the symbol mdot. The highest value of heat flux in the engine is found in the nozzle throat, where the hot gas flow area is smallest. Usefully, RPA also gives us nominal engine dimensions and the nozzle throat diameter of the design mentioned above comes out at about 70mm or 0.07m. In order to calculate the total amount of heat transferred to the coolant, Q, we must first find the average heat transfer rate, q. To find this we need the nozzle hot gas side heat transfer coefficient, or hg. For other parts of the engine this calculation is slightly complicated by the fact that the hot gas stagnation temperature and the temperature of the gas very close to the wall are not exactly the same, due to boundary layer effects. What is known as the adiabatic wall temperature or Taw has to be found by multiplying the chamber gas stagnation temperature by a so called recovery factor. Fortunately enough the recovery factor at the throat is 1, so the chamber stagnation temperature can be used as the adiabatic wall temperature at this point. It should be borne in mind now that this adiabatic wall temperature is not the actual wall temperature; if it was the wall would melt! The point of the cooling system is to prevent this. Therefore, a maximum temperature is defined that the wall can be at without being seriously weakened. This is the hot gas wall temperature or Twg. So, Taw is the temperature of the boundary layer gases adjacent to the wall, whereas Twg is the temperature the wall needs to sit at to retain adequate strength to keep the beast in the cage. Twg is brought about by the action of the cooling system. Having defined the temperatures inside the nozzle it is time to look at the equations needed to calculate hot gas side heat transfer coefficient hg, average heat transfer rate q, total heat transferred Q and thus the coolant flow rate required, mdot. At this point the explanation is going to get a bit algebraic. Please bear with me. I know this type of thing looks like gobbledegook and believe me, it is as tedious to type as it is to read. That said an important result should come out of it and one that I hope you, the reader, will be able to help me confirm or deny. Using this heat transfer coefficient we can work out the average heat transfer rate, q, spoken of earlier, and from q can be got the total amount of heat transferred into the coolant, or Q. Earlier it was mentioned that there are two temperatures of interest in the nozzle flow. These are the adiabatic wall temperature Taw, which can be thought of as the actual gas temperature in the nozzle region. The wall temperature desired to prevent structural failure is Twg. This figure for Twg is chosen to give 90% of room temperature UTS for 6082-T6 aluminium, on which the engine chamber and nozzle wall thickness is based. A lot of rocket engine literature gives these types of figures in Imperial units. I wrestled with these in my early design efforts, but for the sake of my sanity I soon moved over to SI. The figure of 5.32MW/m^2 is about 3.26 BTU/in^2degF in old money. That might sound like a lot, and it is. Remember that the throat has the highest heat flux of any part of the engine and is therefore the most stringent in terms of cooling. Having discovered q it now becomes possible to calculate what the temperature of the outside wall of the nozzle will be. This is the wall in contact with the coolant and we call this temperature Twc, the temperature of the cooled wall. This temperature is found by evaluating the heat conducted through the nozzle wall. Temperature figures given in Kelvin can be hard to envisage. Considering that 373K is about 100 deg C, and the desired Twg was 150 deg C, then Twc seems about right given the very high thermal conductivity of aluminium. Knowing this temperature difference it now becomes possible to calculate the total quantity of heat transferred from the hot gas side to the cooled side of the nozzle. The inside area of the nozzle throat is simply the circumference multiplied by the length. Since the diameter is 0.07m the circumference is 0.219m. The design length of the throat section is 10mm or 0.01m. Hence the area is about 0.0022m. The coolant flowrate required to remove this quantity of heat can be found by assuming a coolant inlet temperature, Tinlet, of 293K (about 20 degrees Celsius). As previously stated the throat is the trickiest cooling problem; taking the “cold” coolant (fuel) direct from the tank and putting it through the throat jacket would seem to make sense. Assigning a coolant outlet temperature of, say, 320K (about 50 degrees Celsius), the coolant inlet to outlet temperature difference is 30 degrees. Remember that the coolant or rather the fuel is being expelled from the tanks under pressure. The pressure drop between the tanks and the injector/chamber will be 0.7MPa (100psi). The boiling point of isopropanol at this temperature is in the region of 413K (140 degrees Celsius). So there is plenty of headroom in terms of the coolant temperature rise. As the coolant flows through the throat jacket a boundary layer will be set up close to the outside throat wall. The convective heat transfer will take place in this boundary layer, so it seems prudent to use a figure for specific heat capacity at the temperature of the coolant at this point. This is known as a film temperature, Tfilm. This can be thought of as the average of the cooled wall temperature and the inlet temperature. So far the calculations show the cooled wall will be sitting in the region of Twc = 373K (100 degrees Celsius). The inlet temperature, Tinlet, is 293K (20 degrees Celsius). The specific heat of isopropanol at this temperature is 2.8 x 10^3 J/kg-K. Using this figure it is now possible to use equation (6) to calculate mdot, the flow rate required to cool the nozzle throat. Got there in the end! Recall from the earlier discussion of the engine design that the fuel and hence coolant flowrate is 1.4 kg/s. To summarise what I think these figures show, a flow rate of about 0.136 kg/sec should be adequate to remove around 11.4kW from the nozzle throat area. This should give a hot gas side temperature of around 150 degrees Celsius and a cooled side temperature of 100 degrees Celsius. The coolant temperature rise will be in the region of 30 degrees Celsius. If the preceding paragraph sounds like I’m hedging, it is because I am! These figures are very much order of magnitude as opposed to exact; remember, I’m trying to “make sure it doesn’t melt”. What I hope is shown, if I have got it right, is that putting the full fuel flow of 1.4 kg/sec through the throat jacket will be more than ample to cool it. It does get a little more complicated than this. The type of flow is very important. High heat transfer requires turbulent flow and that means a Reynolds number in excess of 10,000. Fortunately other calculations that I’ve done (don’t worry, I’m not going to show them, I think you’ve suffered enough…) show that Reynolds numbers much higher than this are possible with a flow velocity just over 1 m/sec, based on a flow area of about 0.0013m^2. If the flow is arranged to be perpendicular to the throat area instead of parallel things get even better, as extremely turbulent flow then results with vortex shedding. This so called cylinder in cross flow arrangement is highly beneficial for heat transfer. A rough surface also helps to increase heat transfer and induce a higher Reynolds number for a lower velocity. This is why golf balls are dimpled. So if, say, I was to put a knurl on the outside surface of the nozzle area that would very likely increase heat transfer. Another aspect of this is something called nucleate boiling. As the fluid film temperature approaches that of the cooled wall, small bubbles start to appear. These rapidly detach and condense in the cooler surrounding liquid. More bubbles are then produced and the cycle repeats. This process massively increases heat transfer. The surface of a knurl would provide excellent nucleation sites for the bubbles to form. The feed pressure of the fuel could thus be tuned to induce some nucleate boiling. If you have got this far, thank you for staying with it. Perhaps now you would allow me one last indulgence and tell me if you think I have got it somewhere near right! Last week I finally got around to testing the pottery kiln that I intend to use as a heat treatment oven. The tube bundle thrust chamber will be a weldment composed of 6082 and 6063 elements. In order to solution treat or artificially age this I have to raise it to a temperature of 525 degrees Celsius +/- 10 degrees and hold that for a specified time. The kiln is fitted with what looks like a relatively sophisticated temperature control system based around a thermocouple. I doubted whether this would be very accurate given it's intended use for firing pots. The temperature control dial is calibrated in 20 degree increments, so I wanted to find out just where exactly 525 degrees would lie. The top and side of the kiln are fitted with inspection holes that are plugged up with ceramic bungs. So I draped one of my K type thermocouples into the top hole and carefully replaced the bung so as to trap the cable in place. In this way the thermocouple was suspended roughly in the centre of the kiln's heated space. I had the thermocouple connected up to one of the amplifier units that I have shown previously. The output from this was fed to one of the ADC inputs of an Arduino Uno. The Uno was programmed using LINX toolkit for LabVIEW. The LabVIEW application that was built for the Uno was running on the laptop to which the Uno was connected by USB link. The workshop roller door was fully opened to guard against any build up of fumes and a fire extinguisher was placed close at hand. Having set the temperature dial to what I reasonably hoped would give 525 degrees, I plugged the beast in and fired it up. A satisfyingly loud hum emanated from the kiln and the temperature began to climb almost immediately. At around 200 degrees smoke started to escape from the lid of the unit, which at this point was slightly ajar. I grabbed the extinguisher in trepidation but I needn't have worried; clearly just grease or some other residue burning off after months of disuse. Satisfied that all was well I shut the lid properly and snapped closed the toggle fastener to make a tight seal between the lid and the main case of the kiln. The temperature was still increasing steadily and the rate of increase had gone up with the proper closing and sealing of the lid. After 25 minutes of running the 450 degree mark was breached and after 35 minutes a temperature of 520 degrees was attained. This finally settled down at 530 degrees and stayed there, give or take a degree either way. I didn't think this was too bad at all, what with my initial misgivings about the accuracy of the control system and that the dial had been set quite roughly. Below is a screen shot from the LabVIEW temperature display showing that 531 degrees Celsius had been attained. More details to come on the tube bundle design and tube bending arrangements. 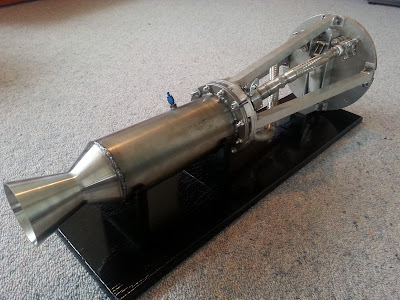 You all know that the subject of this blog is amateur rocket engineering. I've always thought of myself as the most amateur of amateurs, but I'm pleased to report that my small attempts have garnered attention on the other side of the world. Iain Finer is in New Zealand and is therefore my Commonwealth cousin, as well as a brother in the fraternity of rocket engine constructors. No slouch in the engineering department, Iain has completed an excellent regeneratively cooled liquid fuelled engine, shown below. Thanks again Iain for your interest in my project. Now I'll have to produce something worthy of your august pages...Stay tuned. My internet research frequently involves trawling through old patent documents. These often provide a wealth of information, and I'd like to share some of this with you now. Great Britain patent 376,974 was applied for in August 1931 by the Swiss engineering firm Brown Boveri. Granted in August 1932, it has as it's object "Improvements in and Relating to Combustion Chambers". This is one of the earliest references I can find depicting a combustion chamber made from tubular elements to allow a coolant to be circulated through. Whilst the invention described was intended for the production of power, not thrust, it is easy to see where the concept of a tube bundle thrust chamber may have originated. The document also describes the use of bands of material welded around the tube bundle to take the hoop stress caused by the combustion pressure. All of this information will go in to the pot and add to the tube bundle design effort. Greetings all. What's this title all about then? Well, the dyne is a unit of force, and I am away from home...I am back out earning a living at present, so this is a bit of a first for my project and the blog - the company I work for have allowed internet access to personal sites and so I'm able to post here whilst I'm away. I have been looking into the forces required to break a hypothetical aluminium test piece, in order to come up with a set of dimensions that keeps the pressure needed within acceptably safe limits. The hose on the enerpac type ram I'm using is rated to 10,000 psi. That said, the fittings that I have to connect a gauge in the system are only good for 6000 psi. So there is my limit. The 6082 plate I intend to make the test pieces from is 6mm thick. A 10mm wide gauge portion of this material would thus have a cross sectional area of 60mm square. As the average UTS of 6082 T6 is 300MPa, or 300N/mm^2, the force required to break a piece of this area is 18kN. 18kN translates to 1835 kgf. The surface area of the hydraulic piston is about 7 x 10^-4 metres square. As pressure is force divided by area, this gives 2621428 kgf/m^2. In more familiar units this comes out to about 3730 psi, or 257 bar. This is well within the acceptable safe range for the fittings and hoses being used. This time out my work has involved a project with an aluminium TIG welding element. Here is a photograph of a joint I made yesterday. The test pieces will be cut from a plate that has been halved and then welded back together again with a seam similar to this one. The control piece will of course be a solid section, that we now know will take about 3700 psi to break. What figure can we expect a newly welded, non heat treated test specimen to break at? Assigning a value of about 190MPa as our UTS, using the calculation method above gives a force of 11.4kN. This translates to 1162.5 kgf. To produce this using the enerpac type jack will require a pressure in the region of 2360 psi or 163 bar. Theory is one thing; practice can be downright embarrasing. We'll just have to wait and see. As a material for thrust chamber construction, aluminium is superior to stainless steel in a number of important regards. Steel is typically 2.5 times the density of aluminium, which has obvious impact on power to weight ratio. Aluminium has 92% higher thermal conductivity compared to stainless steel, easing cooling circuit design. Although aluminium exhibits lower strength at elevated temperatures, this tends to be offset by the material’s excellent heat transfer characteristics. Aluminium is easier to machine and less expensive, enabling time and cost savings to be realised. The strongest of the commercially available 6000 series alloys is 6082 T6, with a UTS in the region of 300MPa. It can be had in all the major sections, as well as plate and sheet. That said, the smallest tube diameters tend to be on the large side for the projected design application. For suitable tube it is necessary to use 6063 T6, which is ideal for these sizes as it is easier to extrude. This has a UTS around the 250MPa mark. The graph below shows the behaviour of various alloys, including 6082, at elevated temperatures (European Aluminium Association). As shown, 6082 maintains 90% of it’s relative strength at 150 degrees Celsius. The other 6000 series alloys follow this relationship closely. 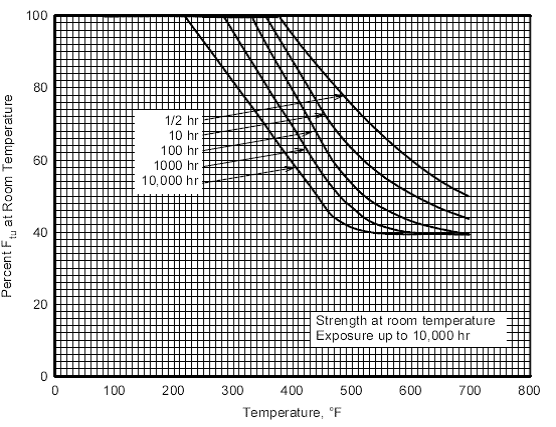 The graph below shows the effect of exposure to high temperatures on the room temperature tensile strength of 6061 T6 (MIL HDBK 5H). At 220 degrees Fahrenheit (approximately 100 degrees Celsius) the tensile strength of 6061 T6 shows no degradation, even after 10,000 hours exposure. This should be familiar territory to anyone with an aluminium saucepan. 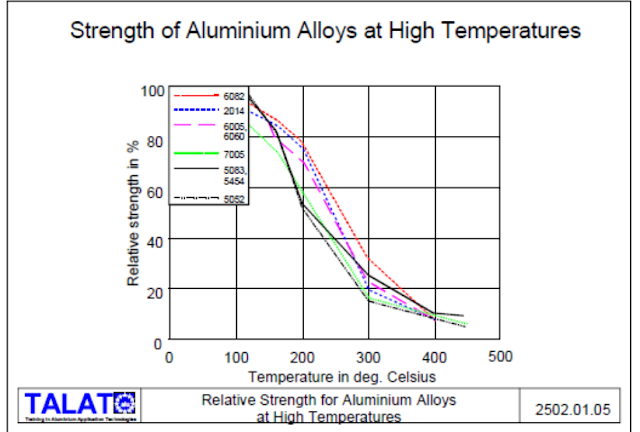 The sweet spot temperature wise for the 6000 series alloys can be seen to be 100 – 120 degrees Celsius. Providing the metal starts out in the T6 condition it should stay that way and have sufficient strength to withstand the combustion forces. The high thermal conductivity and high emissivity of aluminium makes Twg figures in this region feasible, given the current fuel/coolant design flow rate. Basing the chamber wall thickness on 90% of the UTS of 6063 T6 gives a factor of safety of 1.3 at twice the design chamber pressure. The main drawback to the use of aluminium in the present scheme is the loss of temper brought about by welding. The properties of the section in the weld are lowered to the T0 condition. This is a loss of tensile strength of some 80%. However, aluminium weldments may be brought back up to the T6 condition by post weld heat treatment. This typically takes the form of solution treatment followed by artificial ageing. It can be seen that the advantages accrued from the use of aluminium as a material for rocket motor construction make research into the heat treatment problem worthwhile. 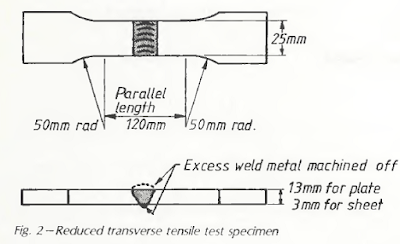 The table below is taken from a Welding Research Supplement by the UK Welding Institute from 1983. The subject of the research was the effect of post weld heat treatment on 6082 T6 and 5083 plates and sheets. The plates were cut and then welded back together, with test pieces being taken from across the weld plane. 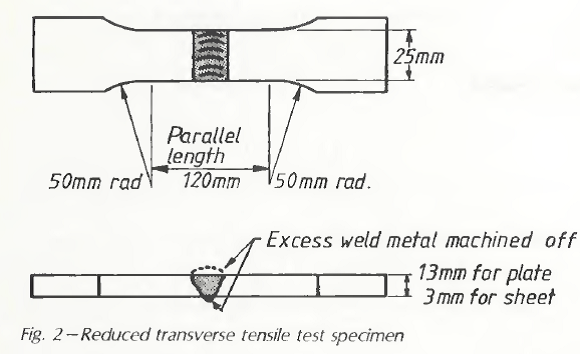 A typical test piece is shown below the results table. The 6082 T6 sheet was TIG welded with 4043 and 5556A rod to investigate the effects of the different fillers. The table shows that in the as welded condition (AW), the 6082 plate joined with 4043 filler showed markedly lower 0.2% proof stress and tensile strength. After artificial ageing (AA) the figures are improved, but still significantly lower than the T6 condition. Both these welds failed in the heat affected zone (HAZ) and show limited elongation. 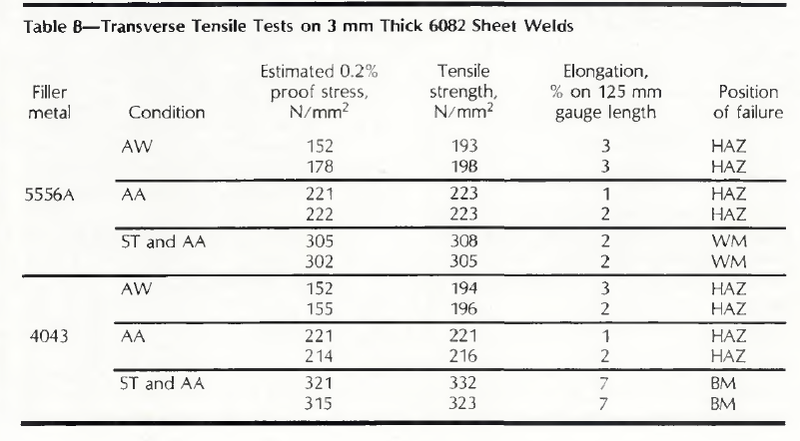 By contrast, the 0.2% proof stress and tensile strength of the solution treated and artificially aged (ST & AA) sample shows values much closer to the un-welded T6 condition. The elongation has also improved, and the test piece failed in the base metal (BM). The table portion below comes from the UK Aluminium Federation's publication "Strength of Aluminium Alloys". This shows the temperatures in degrees celsius, hold times in hours and quenching medium required for solution treatment and artificial ageing of both 6082 and 6063 alloys. So for a tube bundle motor weldment composed of 6063 and 6082 materials, 7 hours at 525 - 530 degrees celsius followed by a water quench and then 12 hours at 170 - 180 degrees celsius would be called for. I intend to produce a number of test specimens similar to the one shown above. These will be in 6082 T6 plate. The test specimens will be of three types, welded with no heat treatment, welded and heat treated in the kiln, and finally a solid section of plate with no weld as a control. The rig is composed of 50mm x 50mm x 4mm steel box section. The test piece fits through the two opposing slots and is secured by pins through the cross drilled holes. The M12 high tensile threaded rods pass through the rectangular frame and terminate at a piece of box section. An enerpac ram will bear against this box section. The ram provides the force to pull the test pieces apart. Force will be inferred from a pressure gauge and extension from a DTI. I could acquire both values by electronic means but I do not want the unit to become a project in it's own right. Based on the ram piston diameter, a pressure of 400 bar (6000 psi) should produce a force of 29kN. This will be enough to break a test piece with a gauge area of 90mm^2. I'm hoping that these tests will show that solution treatment and artificial ageing using the kiln will work. This will be an important step forward in the production of an aluminium tube bundle chamber.